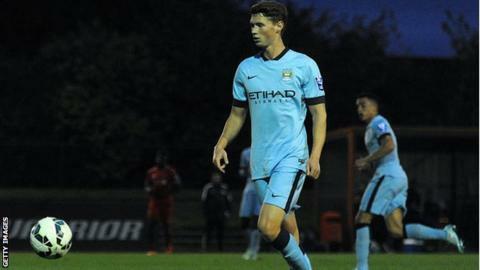 Scunthorpe have signed Manchester City midfielder George Evans on loan until the end of the season and Dutch striker Kevin van Veen for an undisclosed fee. Evans, 20, spent most of 2013-14 scoring once in 25 games. Van Veen has arrived from FC Oss and has agreed a three-and-a half year deal with the Glanford Park club. The 23-year-old has scored 16 goals in 20 games in the second division of Dutch football this season. The transfer will be completed when international clearance is received. "I started from the amateurs and every year I made one step further and this season I played in the second-highest division and did really well, so a lot of clubs came in for me and I am happy to sign for Scunthorpe," he told the club website. "It is really fast compared to football in Holland - fast and physical. In Holland it is only fast, so I will have to get on the weights and score a lot of goals."